The question here is – Which is the word they take more offense to, ‘bank’ or ‘America’? President Obama will be delivering his acceptance speech at the Democrat National Convention in Charlotte in early September. Recent campaign e-mails have been touting the event, held at Panther Stadium. Problem is, there’s no venue by that name in Charlotte. 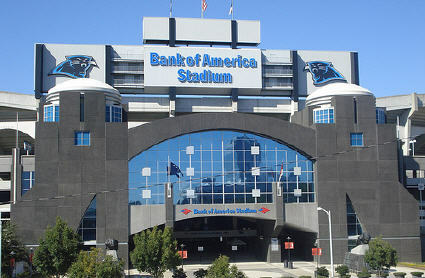 It’s the place where the Panthers play, but it’s actually called Bank of America stadium. Another email in June made the same pitch about the stadium. A host committee spokeswoman didn’t respond to an email. But it’s not like the stadium was ever called Panthers Stadium – first opened in 1996, it was Carolinas Stadium, and later Ericsson Stadium. Then the current corporate iteration.